Nepafenac is a prodrug of amfenac that acts as an inhibitor of COX-1 and COX-2 activity, used in the treatment of pain and inflammation associated with cataract surgery. Indicated PN and MES spheres were shown expressing GFP under the control of a 7 × TCF/LEF optimal promoter cassette (7 × TOP) and constitutively expressed nuclear mCherry. PN 84 and MES 1123 were treated with Wnt3a (200 ng/ml), indomethacin (Indo; 20 μM), or a control (vehicle). Scale bar, 100 μm. Bar graph, quantification of fluorescent signal of GFP (TOP-GFP) versus mCherry (PGK-H2BmCherry). The percentage of GFP- and mCherry-positive spheres was determined by FACS. Sulindac is a non-steroidal COX inhibitor, which potently inhibits prostaglandin synthesis, used in the treatment of acute or chronic inflammatory conditions. (d) Parental and regorafenib-resistant HCT116 cells were treated with 40 μM regorafenib, 20 μM sorafenib, 1 μM UCN-01, 1 μM YM-155, 10 μM roscovitine, 15 μM sunitinib, 10 μM crizotinib, 10 nM TRAIL, 10 μM VX680, 20 μM etoposide, 20 μM temsirolimus or 120 μM sulindac sulfide for 48 h. Apoptosis was analyzed as in b. (e) Western blotting of Mcl-1 in parental and regorafenib-resistant HCT116 cells treated with indicated agents as in d for 24 h. Results in (b-d) represent the means±s.d. of three independent experiments. NS, P>0.05; *P<0.05; **P<0.01. Ketorolac is a synthetic pyrrolizine carboxylic acid derivative with anti-inflammatory, analgesic and antipyretic properties. It is a non-selective COX inhibitor with IC50s of 20 nM for both COX-1 and COX-2. Naproxen is an anti-inflammatory agent with analgesic and antipyretic properties. It is a nonselective inhibitor of COX-1 and COX-2. Benzoylpaeoniflorin, a natural product isolated from Chinese paeony root, could inhibit COX-1 and COX-2 in vitro. Parecoxib Sodium is a water-soluble, injectable sodium salt form of parecoxib, which is a potent and selective inhibitor of cyclo-oxygenase-2 (COX2). Indomethacin Sodium is the sodium salt of indomethacin, which is a non-selective, reversible, and competitive inhibitor of cyclooxygenases 1 and 2 with anti-inflammatory, analgesic-antipyretic and tocolytic effects. Deracoxib is a COX-2 inhibitor with >48-fold selectivity over COX-1. It also exhibits inhibitory activity against phosphodiesterase (Ki = 3.6 μM against human PDE4D3). Phenidone, a dual inhibitor of cyclooxygenase (COX) and lipoxygenase (LOX), is an organic compound that is primarily used as a photographic developer. Meloxicam is a selective COX inhibitor, used to relieve pain and fever effects. Meloxicam (0.25 μg/ml) decreases the migration of CF41.Mg cells. Incubation with 0.25 μg/ml meloxicam for 24 and 48 h inhibited the migration of cells compared with the DMSO‑treated control cells in a wound healing assay. A total of 6 repeats were performed and results are presented as the mean ± standard deviation. Representative images of the wound healing assay and quantification if the results are presented. Scale bar, 90 μm. *P<0.05 vs. the control group. (a) Treatment of HeLa cells with 1 mM bufexamac results in the induction of HIF1-α, as determined by immunoblotting. The known hypoxia mimetics CPX and DFX were used as positive controls; vinculin served as loading control. (b) Verification of bufexamac-specific upregulation of HIF1-α. 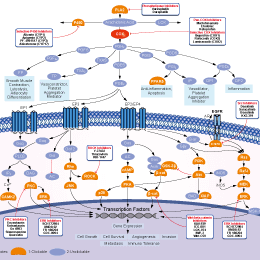 HIF1-α protein expression was analyzed 4 h after treatment of cells with the indicated compounds. Ac, acetylated. (c) Time-course analysis of HIF1-α induction by bufexamac. The induction of HIF1-α protein was analyzed by immunoblotting. The graph shows rapid stabilization of HIF1-α upon bufexamac treatment with half-maximal intensity I1/2 of about 75 min. Error bars represent s.d. of three independent experiments. (d) HIF1-α is stabilized only at higher concentrations of bufexamac and accumulates in the nucleus. Induction of endogenous HIF1-α and its nuclear accumulation was analyzed using immunofluorescence microscopy; scale bar, 10 μm. Piroxicam is a non-selective COX inhibitor, used in the treatment of rheumatoid and osteoarthritis. Etodolac is a nonsteroidal anti-inflammatory drug (NSAID) and a COX inhibitor, used for the treatment of inflammation and pain. Ketoprofen is a dual COX1/2 inhibitor, used as a nonsteroidal anti-inflammatory drug to treat arthritis-related inflammatory pains. Naproxen Sodium is a COX inhibitor for COX-1 and COX-2 with IC50 of 8.7 μM and 5.2 μM, respectively. Lumiracoxib is a novel, selective COX-2 inhibitor with Ki of 0.06 μM. It also inhibits COX1 with Ki of 3 μM. Blood concentration-time profiles for lumiracoxib following single oral administration at 10 mg/kg to (a) Hu-FRGTM mice (n = 3) and (b) to Mu-FRGTM mice (n = 3). Symbols represent concentration-time profiles from individual animals. Asaraldehyde is a natural COX-2 inhibitor, exhibiting 17-fold selectivity over COX-1. Pranoprofen is a non-steroidal COX inhibitor, used as an anti-inflammatory drug in ophthalmology. Zaltoprofen is an inhibitor of COX-1 and COX-2 for treatment of arthritis. Acemetacin is a non-steroidal anti-inflammatory drug and a glycolic acid ester of indometacin that is a cyclooxygenase inhibitor. Tolfenamic Acid is a COX-2 inhibitor with IC50 of 0.2 μM. (B) HeLa and SACC-83 cells were treated with radiation, valdecoxib, or both radiation and valdecoxib. Cells were lysed or extracted for membrane proteins and then subjected to Western blot. Nimesulide is a relatively COX-2 selective inhibitor with IC50 of 26 μM. Nimesulide has no effect on KSHV lytic replication in BCBL-1 cells. The cells induced with TPA for 3 h were treated with the test compounds for 72 h. Then, the effect of nimesulide on cell viability (C) and the number of DNA copies (D) were measured as described in the Methods. CDV (20 µM) is a positive control for inhibiting viral DNA replication. Data were normalized as the fold change compared with the no-TPA induced control. The results are presented as the mean values with standard deviations (n = 3). Bromfenac Sodium is a nonsteroidal anti-inflammatory drug (NSAID), which has anti-inflammatory activity and may block prostaglandin synthesis by inhibiting cyclooxygenase 1 and 2. Nabumetone is a non-steroidal anti-inflammatory drug and its active metabolite inhibits the COX. Antipyrine is an analgesic and antipyretic agent; selective COX-3 inhibitor. NS-398 is a selective inhibitor of cyclooxygenase-2 (COX-2). The IC50 values for human recombinant COX-1 and -2 are 75 and 1.77 μM, respectively. (C)Percentage of TUNEL-positive cell in B were calculated. Data are mean ± SEM; ** P < 0.01 versus the Sham group; # P < 0.05 versus the Vehicle group; unpaired two-tailed Student’s t-test. n = 5 per group. (D-G) ELISA of cytokines IL-1α (D), IL-1β (E), IL-6 (F), and TNF-α (G) in tSCI rats with or without NS-398 treatment. Data are mean ± SEM; * P < 0.05 or ** P < 0.01 versus the Sham group; # P <0.05 versus the Vehicle group; unpaired two-tailed Student’s t-test. n = 5 per group. (H) The mean CBS score in tSCI rats was improved by NS-398 treatment. Data are mean ± SEM; ** P < 0.05 versus the Sham group; # P < 0.05 versus the Vehicle group; unpaired two-tailed Student’s t-test. n = 5 per group. Sulfinpyrazone is one of the most studied platelet COX inhibitors, also a uricosuric agent that competitively inhibits uric acid reabsorption in kidney proximal tubules. Carprofen inhibits canine COX2 with IC50 of 30 nM. Diclofenac diethylamine is a nonsteroidal anti-inflammatory drug taken to reduce inflammation and as an analgesic reducing pain in certain conditions. Diclofenac exerts its action via inhibition of prostaglandin synthesis by inhibiting cyclooxygenase-1 (COX-1) and cyclooxygenase-2 (COX-2) with relative equipotency. Diflunisal is a difluorophenyl derivate of salicylic acid and a nonsteroidal anti-inflammatory drug (NSAID) with antipyretic, analgesic and anti-inflammatory properties. The mechanism of action of diflunisal is as a Cyclooxygenase Inhibitor. Mefenamic Acid is a competitive inhibitor of COX-1 and COX-2. Etoricoxib is a new COX-2 selective inhibitor with anti-inflammatory, antipyretic, analgesic, and potential antineoplastic properties. Oxaprozin is a non-narcotic, non-steroidal anti-inflammatory drug (NSAID) used to relieve the inflammation, swelling, stiffness, and joint pain associated with osteoarthritis and rheumatoid arthritis. Rutaecarpine is an indolopyridoquinazolinone alkaloid isolated from Evodia rutaecarpa and related herbs; a new class of COX-2 inhibitor. Salicin is a phenol β-glycosid produced from willow bark that shows anti-inflammatory effects. It is a natural, non-selective COX-1 and COX-2 inhibitor. Fenbufen is an orally active phenylalkanoic derivative with anti-inflammatory, analgesic and antipyretic activity. It is a non-steroidal anti-inflammatory drug. Meclofenamate Sodium is a dual COX-1/COX-2 inhibitor with IC50 of 40 nM and 50 nM, respectively, used in the treatment of joint, muscular pain, arthritis and dysmenorrhea.